5/10/10 - Bought the yarn (hope I have enough of the grey) and started swatching this weekend. I did a 20 x 20 stitch square of just the foreground eye and it seems to work at this gauge, but I may need to add a spot of grey in the center of the pupil. Jury’s still out on that until the next swatch is done. 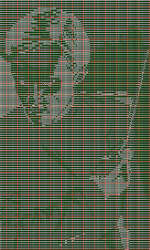 I’m now working on about at 50 x 50 stitch swatch of the main facial features and there are definitely some minor changes. Mainly just need to outline the bottom of the nose, and possibly add a bit more dark on the lips. I’ll have to look back at the picture to make sure. Overall, I’m pretty happy with the way it’s coming. Definitely pleased with the yarn and color choices, and working in size 2 needles with sport weight is a lot easier on me than the size 1s with worsted I’ve gotten myself into for Harry. I’ll finish the swatch with the plan as is so I can make adjustments to the face, then I think I’ll just sally forth with the rest of the piece, so I can get it done in time for the party in a month. 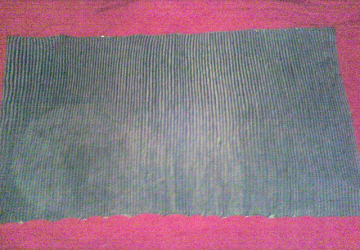 5/13/10 - I did finish the swatch, though I did not photograph it. I think it was a good first swatch, but overall there were several places where the features were not as clear as I want, and the facial expression did not properly reflect Draco’s character. I think it’s partly due to the silver yarn giving a higher contrast to the green than I had previously anticipated being able to find, but at best the first attempt seemed to make him look crazed instead of dark and brooding. I have reworked the design with a lot more shadow, which means another test swatch. I’m actually nearly halfway through the second swatch and I’ve only changed a stitch or two. Draco’s mouth is now far more defined and expressive and I feel fairly confident that the shadow across his chin helps to define his features instead of obscuring them, as I had originally feared. The real test will still ultimately be the eyes, but that remains to be seen (no pun intended). 5/17/10 - Finished the second swatch, though I did not go back and fix all the little changes I made to the pattern halfway through, so I didn’t take a picture, again. I did get some practice in on ripping down one stitch at a time to fix things I didn’t like - which I’m sure will come in handy, but I didn’t have time to fix them all on something I wasn’t going to keep, and ripping and redoing was making it more difficult to read the resulting change anyway. I’m sure on the final piece any changes I have to make like that will block out to the correct proportions, but I just don’t have time to mess with it anymore. The most important part, for me, is that the eyes had a significant improvement. I suspect there will still be some fiddling on the nose and mouth, but the eyes were exactly what I wanted. I’m now about 10% through the actual project and I estimate that if I can get through 5% a day, it can be done by party time. 5/25/10 - Exactly 40% in with 10 days left. I need to get through 14 ridges a day until the end. I’m hoping the intricacy of the face will help the second half of the project go forward, but it’s difficult for me to produce 10 ridges a day. My son has been very attention starved for some reason and is currently seeing me with my knitting as a cue to crawl into my lap or ask for something to eat. My attention for this project is such that it makes it very difficult to not give in to the distraction. On the bright side, the design seems to be working well. I was concerned for a moment that the dark area over the hand would be too dark, but the midtone would have been too subtle and now that I’ve made it to the thumb it seems to have taken shape. I still enjoy the concept of this technique and the effect of these complex pieces and I have new appreciation for the work, concentration, and time it takes to make them. However, I am terribly sorry to say that I am not getting as much enjoyment out of the knitting process as I did with the pattern making. This may be an extreme statement, but I suspect that, if I had to make these projects with any kind of regularity, I fear it would not be long before I gave up knitting altogether. 6/11/10 - I would have made it. One way or another, the project would have been done in time for the party, despite the fact that I worked overtime almost every day that week, or that we were involved in a wedding the same day as the birthday party. Except for one thing. I ran out of yarn. Again. I had enough time over the long weekend to get more of the silver, but Hobby Lobby is closed on Sunday and closes so early during the week that I can never get there in time. The Saturday prior, I thought I would have enough of the green, or that I might have the time to get more, so it was not a priority. However, with the wedding and all the extra time at work, there was no way I could have. So, the project is officially stalled until I get back to the store - and since I missed the gift giving opportunity, I’m not in a rush to push my way through to the end. On the bright side, I think the thing looks great. I was able to bring the 80% that was done to the party and everyone was impressed and surprised (especially when she realized it wasn’t the young Draco I had told her about and I had made the design myself). I really am happy with it and I am looking forward to seeing (and showing off) my finished piece. 6/25/2010 - Finally picked this project back up and started knitting again. I feel much better about the process without the deadline over my head and I am looking forward to getting both Draco and Harry finished, photographed, and off to their recipients. 6/28/10 - Still no photos, but I finally cast off last night. I’m really happy with it. I think most of my frustration was from a misconception on the scope of the project. 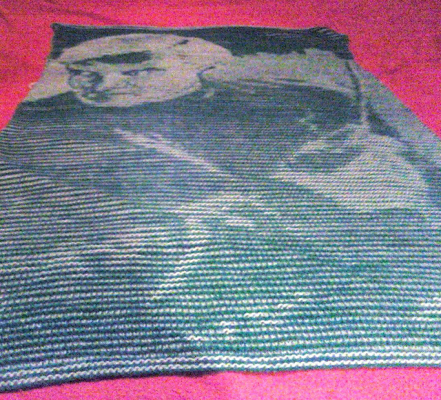 The Harry Potter knit is referred to as a scarf, so I think part of me expected this to be scarf-sized (even though the HP project that I have done halfway is closer to this blanket size than any scarf I’ve ever seen). These projects are much closer to small blankets. I think if I had mentally prepared myself for a garter stitch lap blanket rather than a long scarf, I might not have had the same frustrations on time and materials (I definitely would have bought more yarn to start). I ended up using 2.5 balls of the green and just a dozen or so yards of the fourth silver ball. There may be more photos - eventually. This is an illusion project to pair with Steve Plummer’s Harry Potter illusion. The image of Harry was from (I believe) the Year 5 movie, but the Draco Malfoy that Steve Plummer had done looked like it was from Year 1 or 2. My friend, Holly, is a big fan of the character and actor, but she (obviously) prefers him in his more adult state, such as the most recent film. As Mr. Plummer states he was not entirely satisfied with his previous Draco design, I looked around for some newer images and found one from a poster. Not only is Draco more mature and in a position that more equally reflects the mood of the Harry piece, I think the contrast in the lighting of the photo allows more character detail to show through in the knit design. But, as with all illusion knits, I won’t know that until I see it in the yarn.